Question 1, the proposed income tax surcharge to fund home care for the elderly and disabled, appears to be defeated. The Associated Press called the race early Wednesday morning, declaring opponents of the controversial measure the winners. With 413 of the 574 precincts counted, the question received only 37 percent voter approval. The measure would create a mechanism to subsidize the cost of in-home care for the state’s elderly and disabled residents. Proponents say it is necessary to ensure care to anyone over 65 who is struggling with at least one activity of daily living, as well as anyone living in Maine who qualifies for disability entitlements. The program’s funds would pay for care provided by agency workers and independent home health aides, people who have been underpaid for years, according to the question’s backers. It would be financed through an additional 3.8 percent tax on adjusted gross wage income above the cutoff for Social Security tax, which is currently $128,400 a year. Business owners and self-employed residents would be responsible for paying the full 3.8 percent tax on their income above the cutoff. Wage earners who are employees would split the cost of the additional tax with their employers. Other income such as capital gains would be taxed at 3.8 percent above the same threshold. 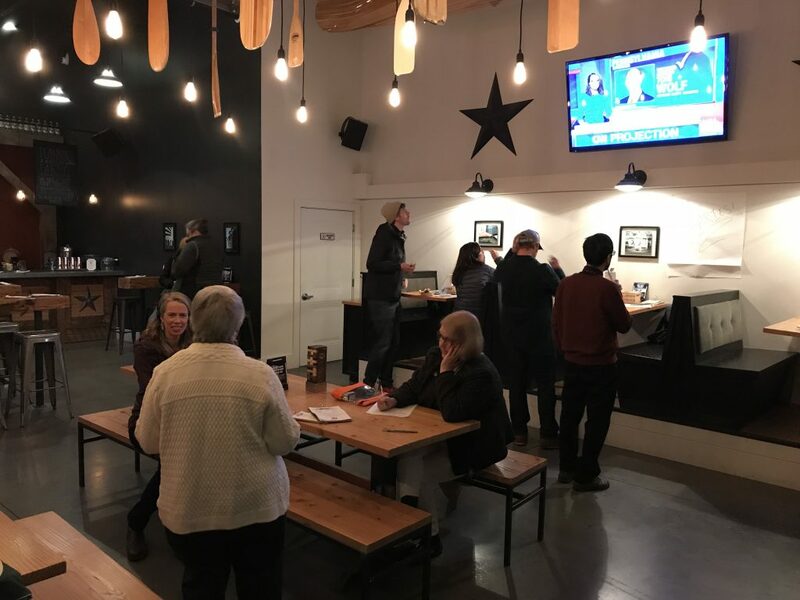 Question 1’s backers, led by the progressive Maine People’s Alliance, met Tuesday night at Stroudwater Distillery in Portland to view the election results. The mostly young, casually dressed crowd sipped on mixed drinks while Bob Dylan music played in the background. Mainers for Homecare campaign manager Ben Chin said his group intends to push for legislation to help Maine’s elderly and disabled residents regardless of how the vote on Question 1 turns out. He noted that everyone seems to agree Maine needs better options for home care. “We’re going to push very hard on the fact that no one objects to the (referendum’s) core purpose,” he said. The opponents, led by a handful of business organizations, met at the Portland Regency Hotel in Portland. It was an older crowd, dressed primarily in professional attire. No on Question One: Stop the Scam campaign manager Ben Gilman said he was cautiously optimistic that Mainers would reject the measure, which his group believes would hurt the state’s economy. “As of right now, it’s looking like (voters) agree that Question 1 is a bad deal for Maine,” Gilman said. Among the many hotly debated components of the referendum was whether the earnings threshold applies to individuals or households. State officials have said the combined income of married couples filing jointly would be subject to the $128,400 threshold, or roughly 10 percent of filers, but the referendum’s backers have said their intent is to only tax married couples on combined income twice that amount. Oversight of the program is also controversial. If passed, the measure would create a universal home care program that would be managed for its first year by a government-appointed board of nine overseers consisting of three members each nominated by the governor, speaker of the House and Senate majority leader. In all subsequent years, the board would consist of members elected by health care agencies around the state, independent service providers and beneficiaries of the home health care program, without any state oversight. Three major political action committees have raised more than $650,000 in favor of Question 1, compared to $550,000 raised by the No on 1 committee. The measure’s biggest backers were the Maine People’s Alliance political arm, which has raised $343,000. It contributed $100,000 to the Mainers for Homecare committee and spent most of the rest on canvassing. The Mainers for Homecare committee has raised just over $400,000, including $300,000 from the Service Employees International Union. The opposition was funded in part by $50,000 donations from the Maine State Chamber of Commerce, the Maine Bankers Association PAC, Maine Association of Realtors, a PAC backed by a Freeport developer called DorksRUs and a $41,000 donation from MaineHealth. In August, a poll of 500 registered Maine voters by Suffolk University in Boston found that 51 percent supported Question 1, 34 percent opposed the measure and 14 percent were undecided.